American just announced their plans for how they’re going to equip and configure all the new planes that they’ll soon be receiving. Two big improvements will be in-seat entertainment and power at every seat (including coach) and fully lie-flat seats in the premium cabin on transcontinental flights. The First Class cabin will be outfitted with 10 fully lie-flat seats in a 1-1 configuration, giving every seat direct aisle access – a feature that no other domestic airline offers. Customers can individually adjust any component of the fully lie-flat seat, designed by Sicma, including the seat back, head rest and leg rest. The seats feature a large tray table and work surface and an individual storage unit for stowing personal items. Seat controls have a more intuitive design for optimum customer comfort and simplicity. 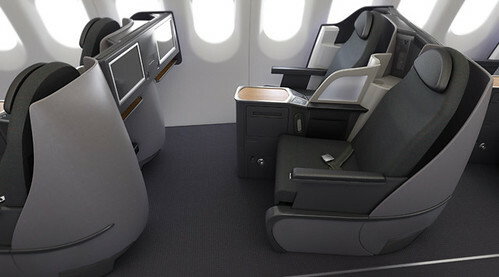 The Business Class cabin will be outfitted with 20 fully lie-flat seats, designed by BE, in a 2-2 configuration. In the Main Cabin the seats will be designed by Recaro and arranged in a 3-3 configuration. The option to enjoy more legroom is available with 36 Main Cabin Extra seats and the aircraft also offers 36 Main Cabin seats. More details about the Business Class and Main Cabin seats will be provided at a later date. To ensure customers traveling from coast to coast have access to the latest in inflight entertainment, American plans to outfit the entire aircraft with seat-to-seat chat, live text news and weather updates, 3-D moving maps, airport maps, connecting gate information, and more. The remaining A321s, as well as all of the A319s and 100 Boeing 737-800 new deliveries, will enrich the inflight experience with modern technology and entertainment options for customers traveling throughout the United States. American intends to replace its fleet of domestic Boeing 757-200s and MD-80s with A321s, A319s and Boeing 737-800s – all with leather seats, Wi-Fi and in-seat inflight entertainment throughout the aircraft. These aircraft will have a two-class cabin configuration, Main Cabin Extra seating and 110-volt universal AC power outlets at every seat. 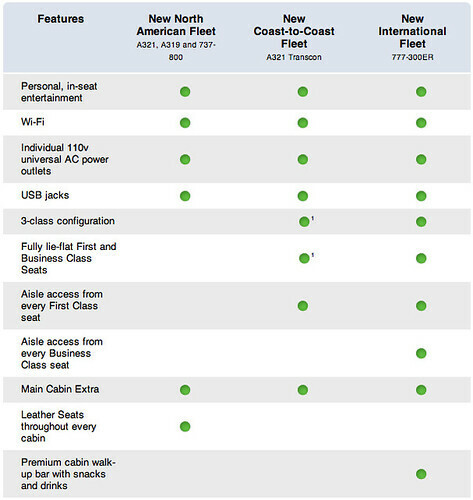 Similar to the innovative inflight entertainment capabilities of the A321 transcontinental aircraft, American also plans to give customers onboard these aircraft access to seat-to-seat chat, weather updates, 3-D moving maps, airport maps, connecting gate information and more. For customers traveling in the First Class cabin, a complimentary inflight entertainment selection of up to 75 movies, more than 150 TV programs, more than 350 audio selections and up to 15 games will be available on a 12.1-inch HD-capable touchscreen monitor positioned in each seat. 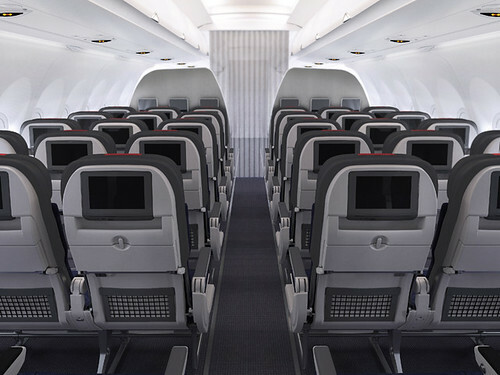 Customers in the Main Cabin will also enjoy an assortment of movies, TV programs, games and audio selections on 8.9-inch HD-capable touchscreen monitors in each seat. Here’s an overview of how the new fleet will look. And here’s some new renderings that they released with today’s announcements. 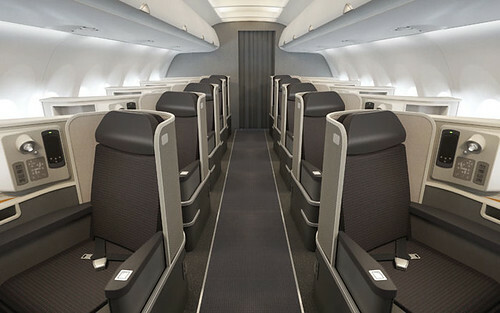 I’ve mentioned before that American’s transcontinental service makes the JFK to SFO one of my favorite routes, I’m excited about the improvements and can’t wait to try out the new seats. Baked on board cookies + fully lie-flat seats + wifi. What’s not to like about that? Here’s a link to a new info page that went up this morning. AA are competing hard for UA big spenders. AA and UA will be competing head to head with the same seats in C and AVOD throughout, as well as both offering extra legroom. DL and VX will be behind up front, but in the back it will all be even. B6 will be interesting to watch, because they have more legroom in the back but inferior IFE. @ Anonymous – Excellent analysis. It’s interesting to see the airlines compete on service rather than price. @ Levy Flight – You’re right. Between today’s announcements and the status match offers, they’re really looking to take customers from UA. I remember more room throughout coach in the 90s. An attempt at higher fares, failed miserably. 4-6 F class, 2-3 rows, 20-24 Biz and 36 MCE and 48-60 MC in my opinion will be better for the routes and airline long term. On the other hand, they may know their market better with historical data. @ ffi – You make an interesting point. I’ve always wondered what percentage of passengers in first and biz on these 3 cabin transcons were traveling on paid fares vs. upgrades/awards.